Charging into a blizzard of unyielding machine-gun and mortar fire, elements of the 29th Infantry Division lead the assault on Omaha Beach, 6 June 1944. The scene at the water’s edge is one of chaos and bloody carnage as the heavily laden troops begin the 200 yard rush across the bullet-swept sands of what would later be known as ‘Bloody’ Omaha. 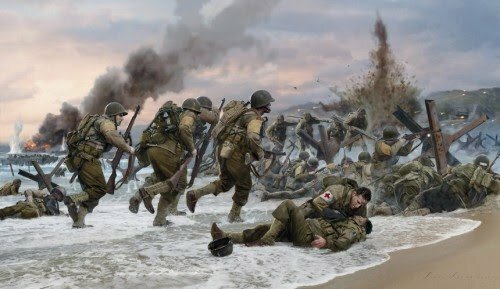 This outstanding FIVE signature Limited Edition Anniversary Portfolio includes the print Assault on Omaha Beach, individually numbered and signed by the artist and two veterans that fought with the 29th Infantry Division in the first wave on D-Day. Private DON McCARTHY Was forced to swim ashore in the first wave with the 116th Infantry Division after his Landing Craft was hit. Private 1st Class NORMAN GROSSMAN Fought his way off the beach with the 116th Infantry Division but severely wounded during the assault on St Lô. 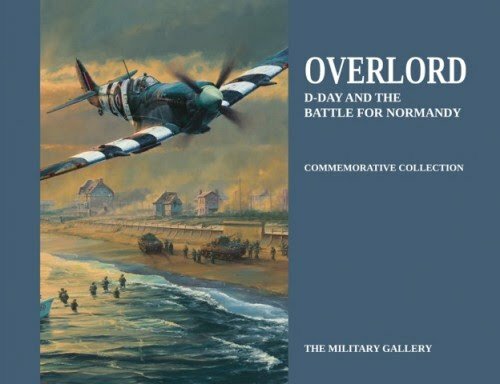 Accompanying each print is a matching numbered limited edition copy of the book Overlord, presented in a superb luxury embossed slipcase and personally signed by a further three veterans who fought on D-Day. Warrant Officer REX STATHAM A Flight Engineer on Halifaxes with 158 Sqn, he flew bombing missions to Caen on D-Day. Warrant Officer RON BROWN A Flight Engineer on Stirlings with 218 Sqn, he towed a glider into Normandy on D-Day. Corporal GEORGE NEWTON Jumped on D-Day with 9 Para to attack the Merville Gun Battery, he fought in the Battle of the Bulge and Operation Varsity. The 29th Infantry Division suffered massive casualties during their assault on Omaha Beach, so to release an edition that is personally signed by two veterans that fought in the first wave, is a simply remarkable achievement and we feel privileged to offer this historic piece to collectors.